This post has been almost a year in the making. It is dedicated to the legacy of my grandmother, Olga Leonie Thompson, who was crowned “The Real Jamaican Rice and Peas Queen.” One day I will share her story with you. 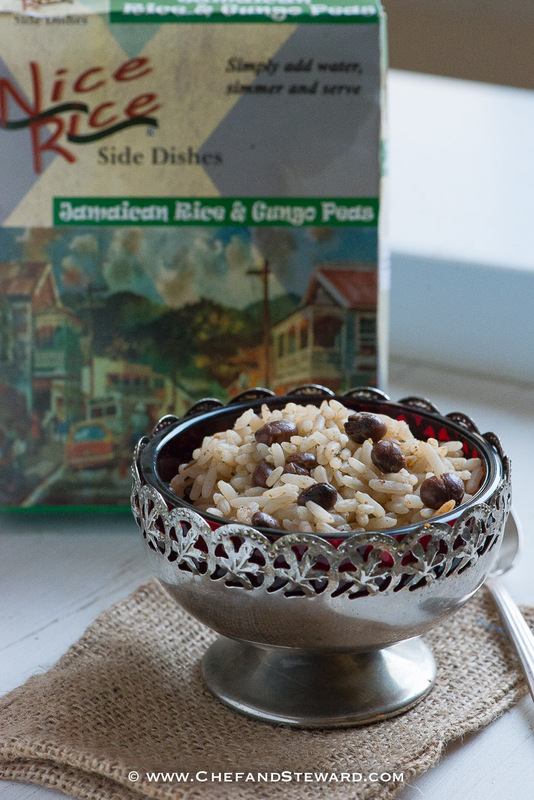 In the meantime, here is a rice and peas that comes in a box that reminds me of Sunday afternoons at her dinner table. 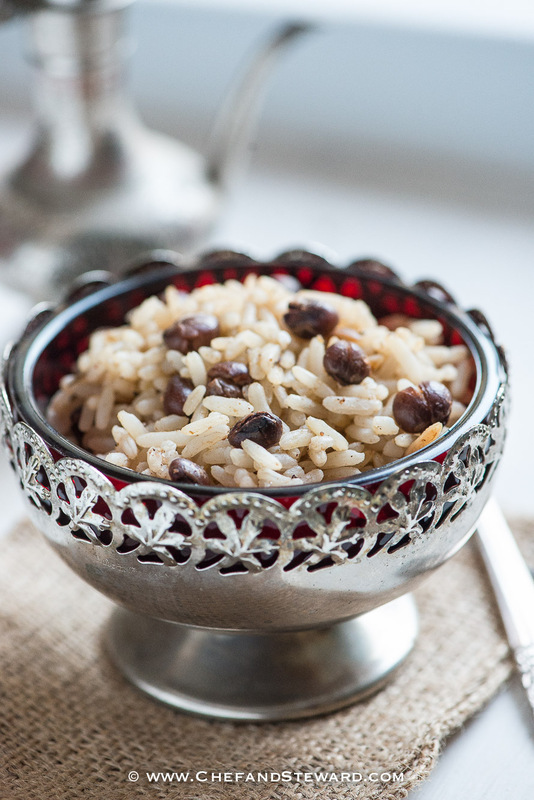 Rice and Peas is traditionally a Sunday Supper in Jamaica. This old school dish required lots of time and care, and in a developing country that did not grow rice, it was usually cooked once for the week. Sometimes if there were leftovers, you would be lucky to have it on a Monday for dinner as well. No Sunday is complete in a Jamaican home without it. Upon arrival at home, the bags containing the ingredients for the rice and peas and other fresh produce, meat and fish for the week would be unpacked and out would come an old school handmade coconut hand grater, that would threaten to grate your flesh if you were not careful. My mother or grandmother would separate the hard coconut flesh from the hard shell with the point of a knife after breaking it with the hand of a cutlas or smashing it on concrete outside to crack it open. Once the flesh was removed, it was grated. Later on when blenders became more prevalent, the coconut was cut into very small cubes and carefully blended. The tough coconut was not exactly what blenders were created for then and many women blew out their prized wedding gifts on coconuts while making coconut milk. Once blenders got sturdier, they were able to simply slice the dried flesh and blend instead of cubes. The coconut milk was placed in the fridge. Dried “peas” would be soaked overnight with a clove of garlic then put on the stove in the coconut milk first thing at dawn before cooking breakfast and getting ready for church. By the time we had to leave for church, the peas was already cooked. I think that’s why Jamaican churches start so late. After church, we would return home and after disrobing from our “Sunday Best” (we really dress up for church), the house coats would come on and all mothers and grandmothers would head to the kitchen to finish the Rice and Peas. Children were required to report to the kitchen to “watch, help and learn” and fathers either went about fixing cars or watching football. By the time this dish was done, everyone had worked up an appetite while the smell of the rice and peas tempted even the flies outside. 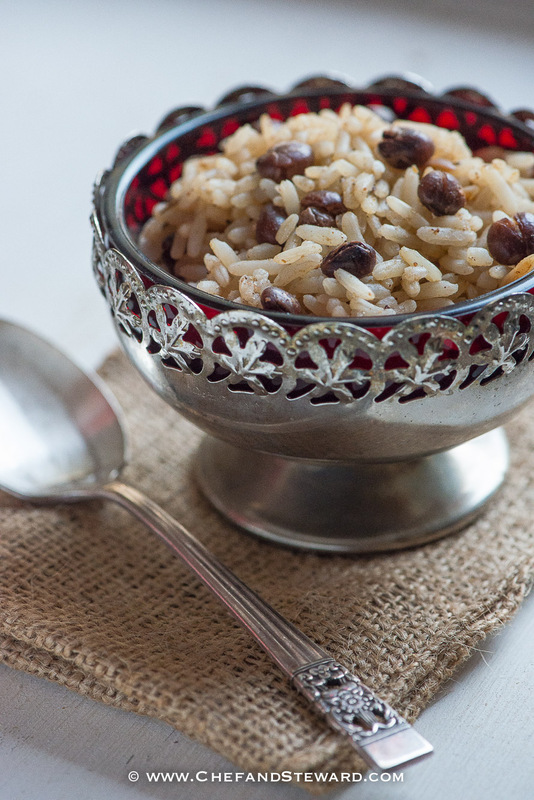 A good rice and peas can be eaten alone (and secretly with a spoon), but usually we serve it with chicken, fish or beef. These days it is easier to make rice and peas with store-bought coconut milk, pre-cooked peas and all but somehow, that authentic flavour gets lost. 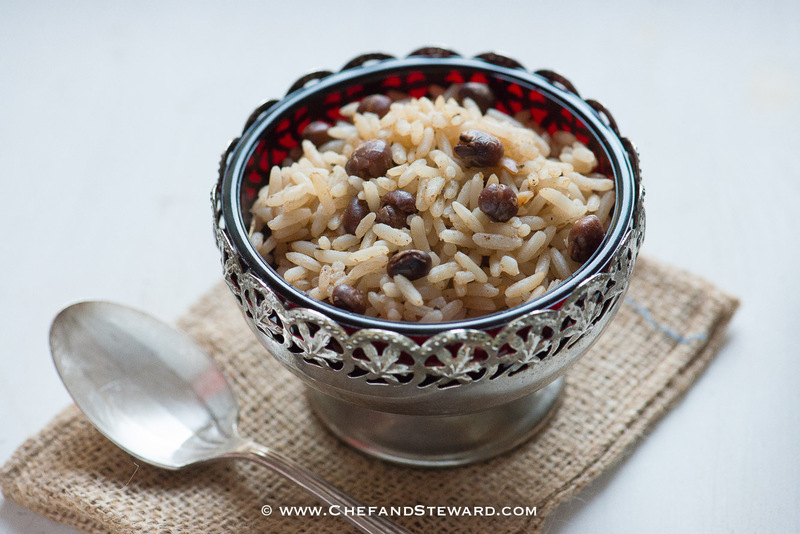 This is why this Nice Rice Jamaican Rice and Gungo Peas stands out. Last year, we were thrilled when my cousin Toni Chin came over to visit us with her rice cooker and some Jerk Chicken during our vacation in Kingston. Toni is a brilliant chef and came from a successful family catering and food business. Uncle David was always creating new and innovative food products and Aunty Sheryl was a beast in the Kitchen and superb with her clients. When Toni served us our Gungo Rice and Peas and Chicken, the room went quit. Lij and I looked at each other and started moaning. It was that good! Turns out Uncle David did all the design and photography for the package himself so I promised to take some photos for him. So here they are. I used a bowl that my Aunty Claudette gifted to me for my food photography (a wedding present of over 30 decades) so this is a really special artisanal family project. Burlap is the fabric in which we package Jamaican Blue Mountain Coffee and the mat you see in the photo is exactly that. This is a 100% authentic Jamaican undertaking from project research to imagery to marketing and we are proud to be part of such an enterprising family. 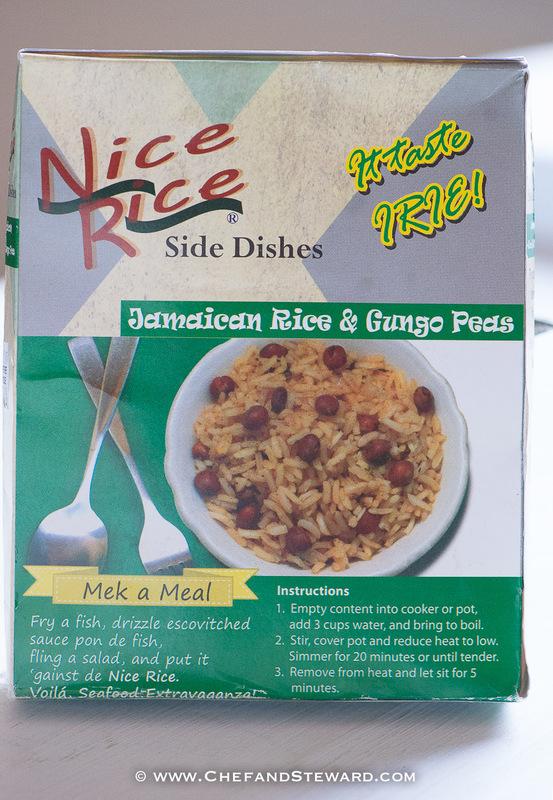 Nice Rice Jamaican Rice and Gungo Peas is available in all Shoppers Fair, Progressive Grocers and Lee’s Supermarkets in Jamaica. It is also available in Canada. For more information, contact bostonbayja@gmail.com o call 876-754-5700 to get information on how to order, stock it, or ship it to you. A bit of press for us! If you are an expat, we’d love to meet you through the group, or if you know expats, do encourage them to join the group to find like-minded people in and around their location. Life is too short to feel disconnected and we do not have to be from the same cultural backgrounds to fellowship together. I would inhale this whenever I was in Jamaica and would have the Lasco porridge for breakfast. And thanks for providing this independent review Ms. T! Canada you say, I hope in Toronto.. I’ll keep a look out but “Grace” seems to own the Jamaican market here. Yes, I am not sure which stores yet. They have a distributor that stocks certain stores. As soon as I get a definitive list I will post. Do let me know if you spot it! I was reading your post and nodding my head the entire time. Reminds me of my childhood, my grandmother made the best gungo peas and rice. It’s been such a long time since I had gungo peas and I don’t want our cultural tradition to die.